Me: I’m a food blogger. Random Person: What’s the name of your blog? Me: Food Endeavours of the Blue Apocalypse. Random Person: That’s an interesting name. Me: Do you know the metal band Tool?... My blog is named after a Tool song. Random Person: You don’t look like someone that listens to metal. This is a conversation that I often have with people. Well I used to have blue hair and wear black all the time, so I looked a bit like a Tool (sorry, pardon the pun) but I’ve grown out of it (I decided it was ok to wear colours and stop killing my hair) but my music tastes remain the same. I have mixed feelings whenever this conversation occurs. On the one hand I think great, it’s kind of cool when you don’t conform to people’s expectations (ie: don’t judge a book by it’s cover). On the other hand I feel a little annoyed, it’s natural to form opinions on others based on how they look and I’m Asian. Being Asian comes with it a whole bunch of associations and stereotypes, which I am anything but…. See this sweet looking cake? It looks delicious, doesn't it? There is a lot of alcohol in it, namely bourbon. It’s not such a sweet looking cake anymore is it? How did bourbon get into the cake? I was at Devilles Pad for a friend’s birthday, someone I had only known a few months. I offered to buy him a birthday drink and asked him want he wanted. He said surprise me. At the bar I looked through the cocktail menu and the drink that stood out for me was Beasts of Bourbon. I thought that he looked like a bourbon drinker and I was right. When I put the drink down in front of him, he instantly recognized it as Beasts of Bourbon and told me that he loved drinking bourbon. In fact, he had two duty free bottles of bourbon at home and he had been wondering what he should do with it all. We spent some time discussing what you could cook with bourbon, notably I told him about an amazing 6 hour bourbon beef short ribs that I had at The Classroom Bar which is something that I will attempt to make at some point. So I had bourbon on my mind that weekend as I was brainstorming a cake for the May Clandestine Cake Club in Perth with ‘decadence’ as the theme. Alcohol is often used in cakes – rum, amaretto, brandy, Guinness…so why not bourbon. I like drinking bourbon. I suspect that I picked this up from going to many metal gigs and ordering what everyone else ordered “bourbon and coke” which appears to be the drink of choice and acquired a taste for it. 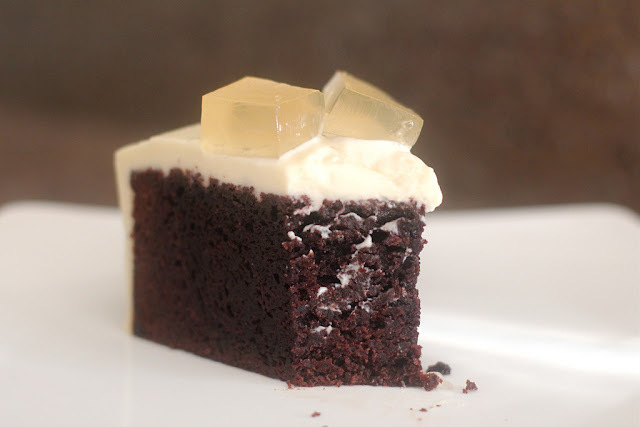 Someone commented on a photo of the cake that without the cream icing it would look like a cake version of bourbon and coke with the ice cubes on top. I’m sure that I could bake such a cake one day and incorporate some coca-cola into the cake batter. It would be a bogans delight. Bourbon and coke has always been known as the drink of bogans/metalheads and I have always wondered why. A search on google hasn’t yield anything but what I have found out about whiskey in general can be summed up as this - whiskey is a so-called man’s drink, it has a reputation as a hard liquor. It always has and still carries with it an association of manliness, it has a prominent place in situations of males drinking together and bonding. Scotch takes on an almost elite status in the eyes of many, representing a dignified drink, it’s almost like the colour of gold. It’s one to have on the rocks while having intelligent conversations about politics, economics and the like. Scotch is that drink that all your male friends mature into. Bourbon on the other hand, isn’t considered as classy. Bourbon is cheaper and its affordability and dark tone lends itself to a younger crowd, the working class and notorious associations with rock’n’roll. My friend Riche suggested that maybe it had something to do with where bourbon is produced, the majority is made in Kentucky which evokes images of rebellion, the wild west, being an outlier of society which is I guess how bogans/metalheads must feel sometimes. So I couldn’t think of anything more decadent than making a cake with one of my favourite spirits, especially when it’s something that people would least expect. To be decadent is to be self-indulgent and I took it to the edge. My cake had a triple hit of bourbon in it. It was made up of a chocolate bourbon cake (1 cup bourbon), cream cheese bourbon vanilla icing (4 tablespoons of bourbon) and bourbon cider jelly (1 shot of bourbon and 500ml cider). I wanted to add an element to the top of the cake so I decided to use apple as it’s a component of a Beasts of Bourbon cocktail. I settled on making jelly with bourbon and cider. 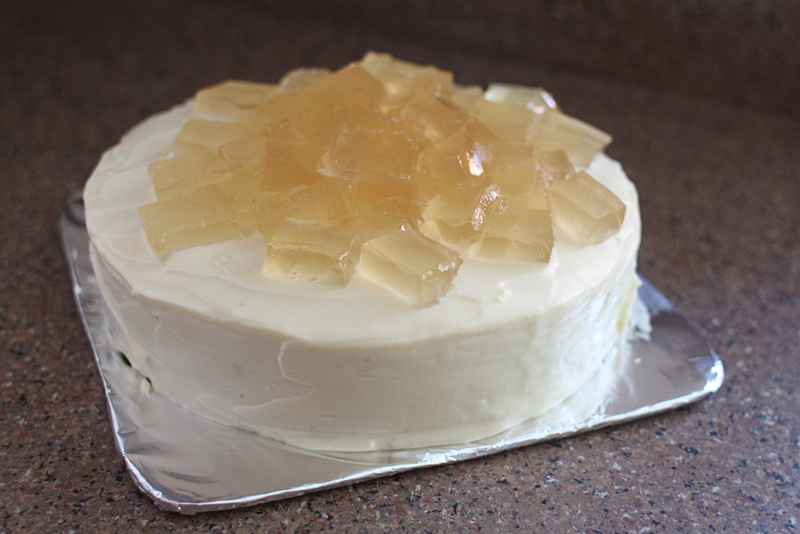 I’m not sure if you are supposed to put jelly on a cake but I was experimenting, and I liked how the jelly wobbled on the cake every time I moved it. I also found out that as I drove over to cake club most of the jelly slide off the cake…opps. It’s like trying to drive with soapy hands, the jelly is quite slippery. If anyone has any ideas on how to make jelly stay on top of a cake, I would love to know. The apple cider jelly went really well with the chocolate bourbon cake. Everyone who tried the cake commented on how well the flavour combination of chocolate, apple and bourbon worked together. When I brought the cake to the Clandestine Cake Club and opened the lid of the container it had been stored in, the smell of the alcohol permeated through the air. I even got a bit drunk making it, it was all quality control of course as I tested the cake batter before it went in the oven, added in the bourbon bit by bit as I was mixing the icing until I got the desired taste and ate some (well maybe a lot of) jelly to make sure it had set properly. I was rushing around that Sunday afternoon trying to finish off the cake and when I stood up at one point I got a bit of a head rush. Consuming quite a bit alcohol and sugar on a Sunday afternoon probably isn’t a good thing. This cake should probably come with some sort of advisory warning, for example: Do not eat cake and then head bang to metal music, it may cause dizziness, feelings of nausea. 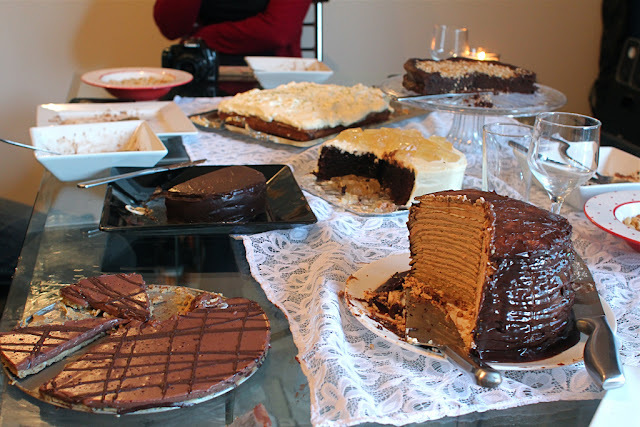 Clandestine Cake Club Perth held on Sunday 20 May 2012 with 6 cakes on offer – caispiroska cake, 16 layer chocolate crepe cake, exploding chocolate gateau, flourless chocolate coffee cake with crumble on top, a white and dark chocolate patty cake, and my chocolate bourbon cake with apple cider jelly on top. FYI – I used Marker's Mark Bourbon. Preheat oven to 180C and line a 20cm round baking tin with greaseproof paper. Add the bourbon and butter into a small saucepan and heat until the butter has melted, then whisk in the cocoa powder until the mixture is smooth. Set aside for a few minutes to cool slightly. Shift the flour, baking soda and salt together in a bowl. In a large bowl, beat the eggs and sugar together until just combined, then add in sour cream and vanilla and beat until well combined. 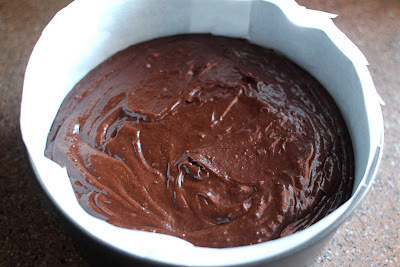 Slowly pour the bourbon-chocolate mixture into the egg mixture and use a whisk to mix in and incorporate together. Add in the flour into the chocolate mixture and whisk to combine. Blend the mixture well together with a whisk but don’t overbeat. You want the ingredients to be combined but you don’t want a light airy mass as the cake should have a dense texture. Pour batter into cake tin and bake for 45 minutes at 180C and then turn the temperature down to 170C and bake for another 10 minutes. 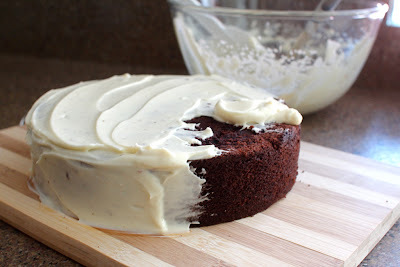 Leave the cake to cool completely in the cake tin as it is quite a damp cake and will also sink a little in the middle. Lightly whip the cream cheese until smooth, sieve over the icing sugar and then beat together. Add the cream and beat until it has a spreadable consistency. Put the sugar and water in a small saucepan and cook, stirring over a low heat until the sugar dissolves. Remove from heat. Put the gelatin leaves in a bowl and cover with cold water. Leave the gelatin to soften in the water for a few minutes. Drain and squeeze excess water from gelatine. Add the gelatin into the sugar mixture and stir to dissolve. Pour the cider into the sugar-gelatine mixture with one hand and use a whisk to combine the mixture with the other hand. Add in a shot of bourbon and whisk to combine. 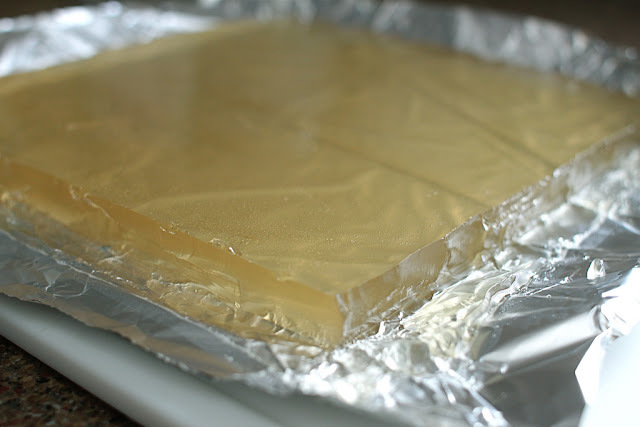 Pour the bourbon cider jelly mixture into a container (I lined a baking tin with foil). Refrigerate over night or at least 4-5 hours to set. Cut the top of the cake to make level. Ice the cake. 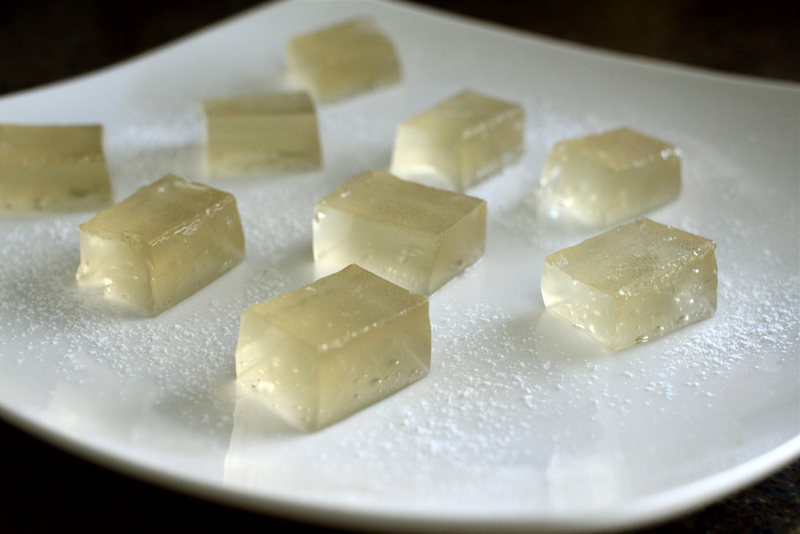 Cut up the jelly into cubes and put over the top. Seriously? Seriously?! Everything about this is brilliant. Thanks JJ :) I think it's my pinnacle cake! Eeeek! I might have been one of those people who said that on first meeting you! Ooops! CCC is so much fun and provides an avenue to get creative with baking. This looks awesome. I'm gonna try to make it. P.S. I get told I don't look like someone who listens to metal either. We're everywhere. pair of nice fitting jeans (ae has alot of cute low rise slight flair destroyed color) with a pair of spike heels (ie candies) (make sure the jeans touch the top of your foot. Mushroom and Rocket Sushi. Vegetarianism.